Kilian’s race ski: light, stiff, and designed to hold an edge in 60° couloirs. The Salomon Minim is a ski with an adventure mountaineering day job and hobby of world-class racing. Slightly wider than a typical race ski, at 68.5mm underfoot, the Minim is designed to be your best friend while accessing faraway stashes of powder, skiing steeps when everybody else has started riding bikes, or being the first to ski a popular ultramarathon course in the dead of winter. It’s also a good tool to win ISMF sanctioned races like Mr. Jornet. The core is tried and true Karuba that has been reinforced with strategically-placed carbon fiber to improve handling and power transfer. Sandwiched among the top-secret high-tech innards of the Minim is a sheet of Koroyd placed in the tip, a technology that Salomon has implemented in their free-ride skis for years. Koroyd is a low-density honeycomb structure that deadens impacts and reduces uncontrolled rebound and chatter at high speeds. This contributes to the already stellar downhill performance of the Minim. The binding mounting zone has been reinforced with carbon fiber and acts as a structural reinforcement for increased edge hold. The sidecut is tuned to favor steep skiing on hard snow, which also makes it a confidence-inspiring technical skinner. Instead of a typical pin-line mounting location the Minim employs a mid-sole mounting location for the utmost downhill performance. Did we mention it weighs only 720g per ski? If you want a podium contender race ski with an adventure mountaineering bias, the Minim just may be the one. CFX Superfiber weave throughout the ski increases torsional stability making it nearly impossible to find the limit of the ski. Koroyd-infused tip is borrowed tech from Salomon’s freeride skis and is 90% lighter than rubber but provides similar vibration-dampening properties. 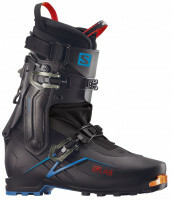 Mid-sole mounting pattern ensures the highest level of downhill performance, perfectly tuned to the individual skier. Kilian’s personal ski, if that influences your selection. It still is, even if it doesn’t. Update for 17/18: Just a new top sheet. Notes A touch wider than most race skis. Bottom Line What Kilian wins on. Hi IVM, your best bet is the Movement Race Skins. The Race Pro 71 Pomoca skins are 65mm wide, perfect for the Minim. I have 30k feet on these skis so far in piste, frozen crud, untouched and chop. I am coming from a ski trab gara aero 70rs in 171. These skis are significantly stiffer, and have a more pronounced rocker. I have found the skiing to be significantly better. The skis are much more capable and predictable and compared to my old race skis i feel as though i do not have to modify my skiing style as much. Very excited to get more time on them, so far they have been the upgrade i was looking for. Highly recommend. Hey Caroline! Sweet! Send me an email at help@skimo.co and we can chat a bit further about the whole setup. They might be the perfect ski for you, but there's also a really good chance that are potentially some other skis that are more your style! Let's talk and we'll go from there! Fantastic problem solver. Had a PDG which were amazing in the climb but made me look like a child on the downhills....wildly unstable. As an alpine ski racer, the Salmon is just fantastic on the downhill. Nice carved turns, good stability and still a great climber. This ski allows you to follow Kilian's dream to roam far and wide and LIGHT in the mountains putting in the occasional 14000 foot day. Amaing design. Salomon designers are wizards!!!!! would these pair up well w/ dynafit boot pdg? if so what bindings would u recommend? Absolutely Jim! These are essentially race skis which pair really well with race boots and bindings. To find a race binding that would work for you, please visit our binding finder. With the little extra width do you cut a custom skin? Which skin do you use? Hey Dan! Custom skin will do great, but the Colltex PDG Race 65mm is the best bet for a kit. You can even go 68-70 for slick conditions. I was wondering if slightly wider (70mm) and trim to fit for steep climbs (mountaineering climbs/traverses etc) would be a slight plus. Will they fray/shed if this is done? And while we're at it can you recommend a couple of bindings from which to choose (looking at the Plum 150 and the Ski Trab Gara Titan Release)? Hi Dan, no problems there. In fact some folks even have a full coverage race skin for some missions. For bindings, please visit the binding finder to find one that matches best with you. If you like light and fast, this ski is the one you want. There's never going to be a question of how fast these things go on the up, but they are also surprisingly capable on the way down. That extra few millimeters width more than a race ski really makes a difference! The Minim has rapidly become my favorite ski for touring and ski mountaineering. If there's a fair bit of fresh/unconsolidated snow, I might grab something else from the quiver, but otherwise I'm on Minims. During descent, they are stiff, snappy and have some of the meanest edges I've found on any ski. They eat up ice, corn and even not too deep powder. They do require a solid technique, but can forgive some minor indiscretions, and they are quite capable of being pushed hard and fast in the right conditions. The only place they struggle a bit is in firm cruddy cut up snow...but if you have these skis, you won't be near anyone else's tracks. My only other minor criticism is that the edges don't quite run long enough in the tip, meaning that mine have some small dings that I've patched up with epoxy. In summary, this is a ski that has all the benefits of a race ski (including tip notch) but skis much more capably, and should be in serious consideration for those who like to roam far and maximise their quantity of turns in the mountains. As an update, I'd give this ski a 3.5 - 4 stars for everyday use...They are a lot of fun, but if you encounter variable snow or heavy, wet powder, then they become quite hard to manage. In the right conditions (and as long as you aren't going too fast), these skis are a lot of fun.